Copper Has a New Home! 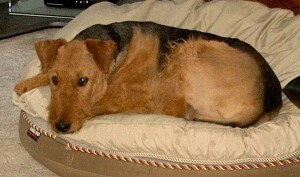 Copper is a very solid 65-70 pound neutered male Airedale without an ounce of fat anywhere on his body. His hind quarters literally ripple when he walks or runs. He is well-proportioned and his coat is good with bright coloring. Overall, he is a handsome boy. Copper is really friendly towards people. He is a confident lad, yet displays no aggression or undue assertiveness towards humans. He can be playful and offers kisses. He responds to a few commands and takes direction well. He works happily for treats. Copper pulls somewhat on leash – leash is taut as if he were on a mission – but is otherwise cooperative, responding to changes in direction and pace at the walker’s whim. This boy sits nicely for his meals, taking the food only after a release command is issued. He appears to have good manners. Recall, however, is an issue. Copper will need extensive training to hone his recall skills before he can be allowed to exercise off-leash, particularly as he comes from working stock and has, like most Airedales, an ingrained prey drive. Copper displays an inclination to be the “top dog” in a pack. Once he has established his leadership role, he plays well with the pack. He is not an aggressive dog but, clearly, will not tolerate challenges from other dogs. Throughout his four years, Copper was kept outside. He is adapting very well to living in a home with his foster family and two female pack-mates. An ideal home for Copper would be located in a rural or semi-rural area with adult owners who are capable of providing leadership to this dog. Because Copper is a strong boy, his owners must be physically able to manage him. We think he would welcome reasonably-sized, somewhat submissive female canine companions. Dog-savvy cats are fine but, given Copper’s size and energy-level, we will not adopt him to families with small children. 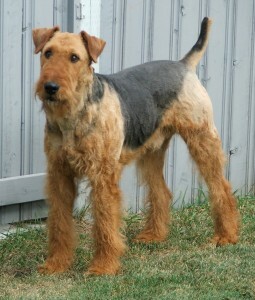 This good-natured but strong alpha dog is a spectacular find for the right home where companionship is desired and Airedale characteristics are admired.